Is Motorola making a premium device? Leaked images of an unknown Motorola phone - which could be the Moto Z4 - published by CashKaro and sourced by reputable Twitter leaker OnLeaks, show this four-camera rear array, as well as a small 'teardrop' top notch and no visible fingerprint sensor. Previous phones such as the Moto Z3 and Moto G7 Plus boast two rear cameras, so four would be a significant step forward for the brand. Similarly Moto phones usually have a rear-mounted fingerprint sensor, and the lack of an obvious one in the render suggests this mystery Moto will have an in-screen one, which falls in line with a Moto Z4 rumor from 2018. We can also see a USB-C port, and a 3.5mm headphone jack, in the renders. The four cameras is the real novelty, although we've only just heard a rumor that the next Moto phone will have a triple-lens rear camera array. For now, it's worth taking the image with a pinch of salt, as there's no official word from Motorola on its next flagship smartphone. 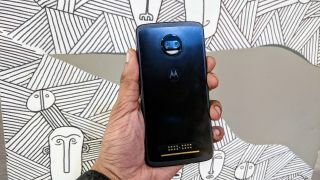 The Moto Z3 - its most recent flagship offering - launched in August 2018, so we're likely still several months away from a Moto Z4 launch, if it ever happens.